Snowmobile Racing at its Best! Race results from 2018 are posted on the Voyagaire website blog. The overhead photo below was taken in 2016 when hundreds of spectators got to witness an amazing speed of 178.2 miles per hour on our 1,000 feet of shaved ice. On March 3rd, 2018 the top speed was over 174 mph. On March 4th, 2017, the top speed was 177.4 mph! This is a great event for the whole family! Bring your machines and see just how fast they can go. There are 45 different classes for all ages and all types of machines with trophies and cash prizes! Racing lasts from 10-4 pm on Saturday with typically over 500 runs to watch. 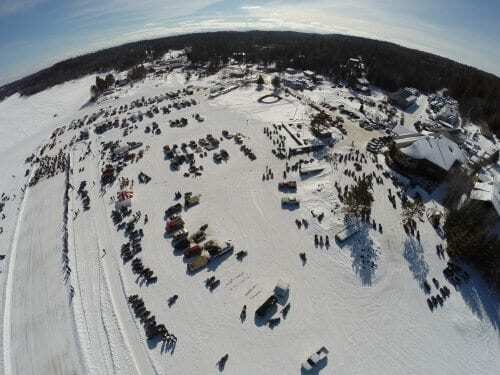 In 2018, the Crane Lake Challenge added Sunday Drags - side by side racing over 660 feet (on 2,000 feet of shaved, shut down ice) using a Porta-Tree system. 35 classes on Sunday including an Outlaw Shootout. Call 218-929-8043 or 800-882-6287 with questions. Join us - always the first Saturday in March!